Im wanting to add roof clearance lights on my 2015. Can someone give me the part # for the harness and the lights? I'm kind of curious about this also as I just bought a 16. I did have a 2000 prior to this. I got on Recon Accessories web site and they gave me all the info I needed but this has been 6-8 years ago. I then found on this forum where to tie into the wire running up to the top of cab for the harness. I'll check back in and see if you get anything tho. "When it's upsidedown and burning, you've gone too fast." "Customer Service is an ATTITUDE! !...not a department!" 2016 F350 4x4 Ultimate Lariat crew cab SRW, LWB, 6.7 PSD, 20" wheels, Ingot Silver Metallic, DiamondBack tonneau cover, TrailFX wheel-to-wheel step bars. Ok, I have the lights and harness. Im going to start the install next week. I have a question what type of silicone to use? For as I know, there is no silicone used by the factory when they install the lights. They should have a gasket included with each lamp. I read on here some guys use silicone when they did their's. I did buy all Ford parts. I've never been a fan of marker lights, but when I bought my 2016, it came with them. And, they aren't the amber ones. They are dark gray and actually look pretty cool. Is this a Ford option or did the previous owner upgrade them? Likely OEM location and style and a prior owner changed the color of the lenses. This is an incredile step-by-step instruction of how to do this. And it shows me why I won't be doing it. Way too much patience required, of which I have little. Ha. This would probably be a $500 job at a truck shop. Last edited by MrTommy; 11-27-2018 at 07:02 AM. Well, as it turns out, these lights are Recon aftermarket units on my truck. And now I see that one of them flikers when I turn on the lights or open the door. Once it flickers, it either stays on - or goes off. And I'm not sure how long it stays on because I don't get out to look. I found out that I can't simply get a new set of LED's for the one that flickers either. No no, I have to get the whole set of lights - and replace them all. That's not happening! Even if they ALL burn out, the smoked lenses look cool during the day. And I don't care about once it gets dark and they don't work. I'm retired now and don't go anywhere once the sun goes down if I can help it. I used 3M Marine 5200 sealant when I installed cab lights on my 2001. Good luck on the job, that first hole is a major step. Had cab lights installed on my 2012 this year. $325 out the door. Same place that did my window tint. they are oem with Led lights. Thought they look cool and should help for visibility when towing 5th wheel. Always thought they should have come with the truck. I have the integrated 5thwh/goose neck pkg from the factory. Safety factor is what I am looking at. Plus took the money from my side job to cover them. Read all the info on installing them but they do this for a living. Plus, they caulked them in and said covered for as long as I own the truck. Bing. happy. done. Sorry about pic. I did notice if you click on it pic is upright. Don't get it. 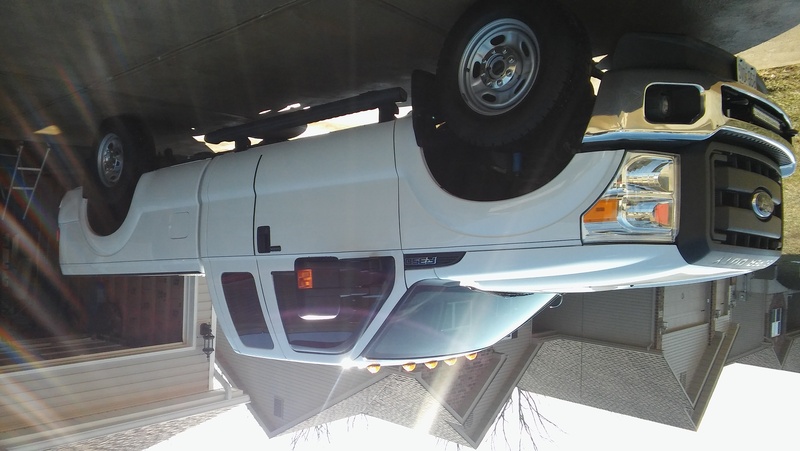 2012 Ford F350 XL, 4x4, SC,6.2 Gas, FX4(StickrsRemoved), LongBed, Oxford White, Xl PremPkg, Oem Fogs, 4-UpFitters, Remote Entry, Hill Assist/Descent, Pos Rear, ShiftOnFly, TracCntrl, SwayCntrl, InTegratBrakeCntrl, 4.30 Axle, Cloth,Am/FmCd,Mp3,SecurityPkg, Integrat 5th/GoosePrepPkg, Gvwr-10700, ReplaceRancho's w/4600 Bilsteins, 5100 SteerStabilizer, PlowPkg,BFG A/T Tires. Tow 2014 Sabre Silhouette 5th wheel rv, 37' rear living, 3-slides. Only if you or the dealer order them to be installed on the SRW truck when built, duh! Most dealers do not order them for SRW trucks for their stock.